If you like to ride dirt bikes, living in Michigan is somewhat like living in California for rock climbers, or living in Tennessee for whitewater canoeists. Dirt riding is a big adventure sport here. Not only is there a huge motocross racing scene, but there's also an amazing system of legal, mapped, marked, off-road riding trails unlike anything anywhere else. The wooded, sandy, mostly well-drained terrain is perfect for trail riding. There are literally thousands of miles of trails through the wooded hills of the northern lower peninsula, and all across the upper peninsula, of Michigan. 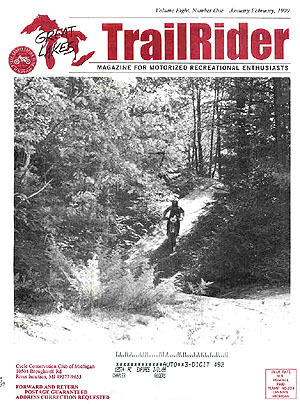 The Michigan motorcycle trail system owes its existance to a dedicated group of riders who formed the "Cycle Conservation Club" back in 1968, in response to an announcement by the DNR that many open riding areas in Michigan were to be ruled closed to riding. By working closely with the DNR, and through effective lobbying over the years, the club gained approval for creating and maintaining the trail system. Through vast amounts of volunteer trail clearance and maintenance work by club members, the CCC has gradually extended the system to it current size. 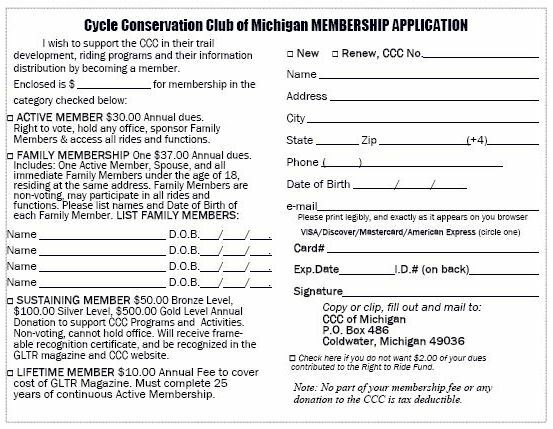 A couple of weekends a month, from May through October, the CCC runs scheduled trail rides over portions of the Michigan trail system. This is a great way to get familiar with the system, meet other riders, and just generally have fun. The events are usually based at campgrounds adjacent to the trails, and offer dirt riders of all skill levels a chance to ride well marked sections of trails in the company of other riders. Loops are usually set up for different interests and skill levels, so that kids, dual-sport riders, and fast single-track woods riders can all enjoy the event. These events are listed in the CCC newsletter Great Lakes TrailRider. See the CCC website at for schedule updates and for other club activities. The CCC also provides another very valuable service. 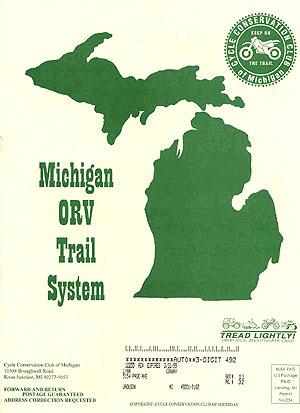 The club has compiled a very detailed map book of all the trails in the system, entitled the Michigan ORV Trail System. 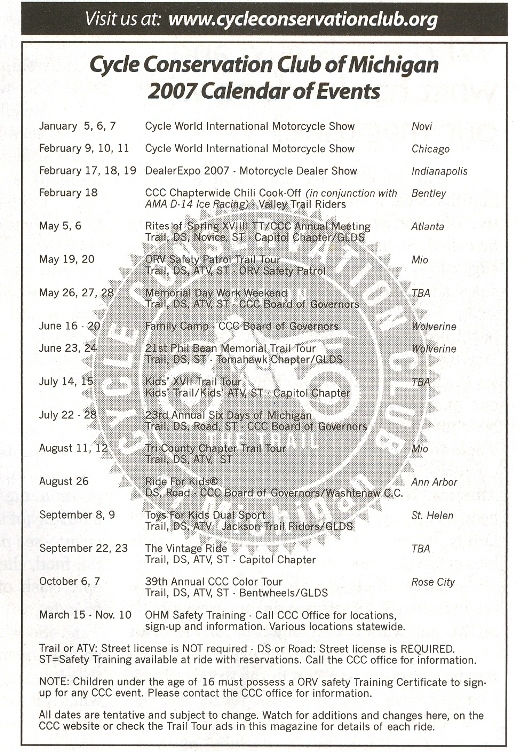 This mapbook is available for purchase at most motorcycle shops in the area, and also comes with membership in the CCC. 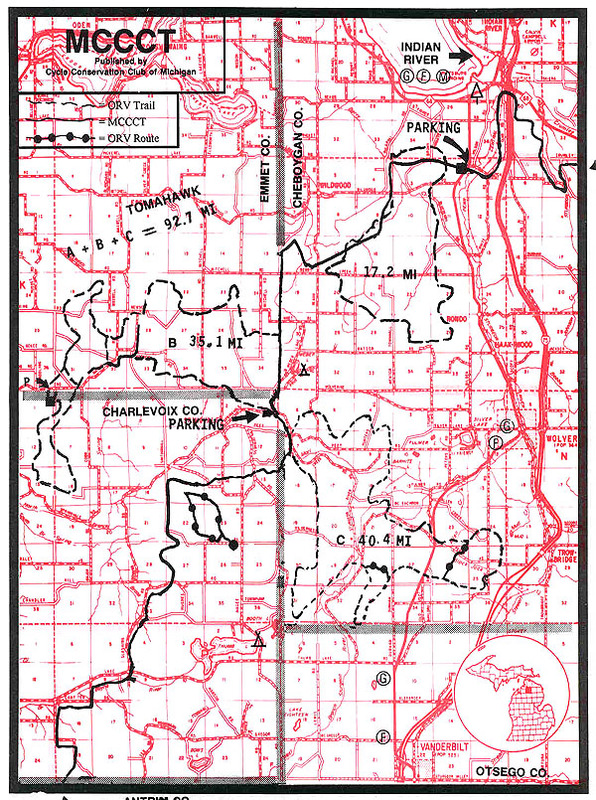 The map key page sketches the areas of the state where the trail loop systems have been built. As you can see, most trails are in the upper portion of the Lower Peninsula, and then are scattered all across the Upper Peninsula of Michigan. In addition to stand-alone trail loop systems, there is a very long, continuous section of trails called the "Michigan Cross-Country Cycle Trail" (MCCCT). The MCCT is seen as the dark lines sketched in on the map key page below. 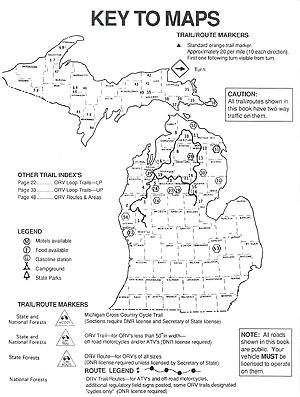 In addition to the bi-weekly trail rides, the CCC offers a premier riding event that is unique in the country, if not the world: The Six Days of Michigan (SDM), which is run each year in early August. This event draws riders from all over the world. Starting in the Upper Peninsula, the ride goes on for six days, eventually crossing the Mackinaw Bridge, and then continuing in the Lower Peninsula. Riders settle in at a new campground each evening, with logistical support provided by the club (trucks carry all the gear from campground to campground). Once you've gone on a few CCC trail rides, and have found some areas that you'd like to go back to from time-to-time on your own, the map book becomes a great resource. As you can see, Michigan offers many unique resources to someone just starting out in dirt riding. Going on CCC trail rides is a great way for the new dirt rider to quickly gain experience in handling all sorts of terrain and riding conditions. Scrambles areas and open practice days at motocross tracks provide terrain where you can open it up a bit and build your skills at turns, whoops and jumps. As you gain experience, you can then decide whether your interests lean more towards informal trail riding and woods riding, or perhaps enduro competition (timed events held on the trails), or the technical riding and competition of motocross (or maybe all three! ).